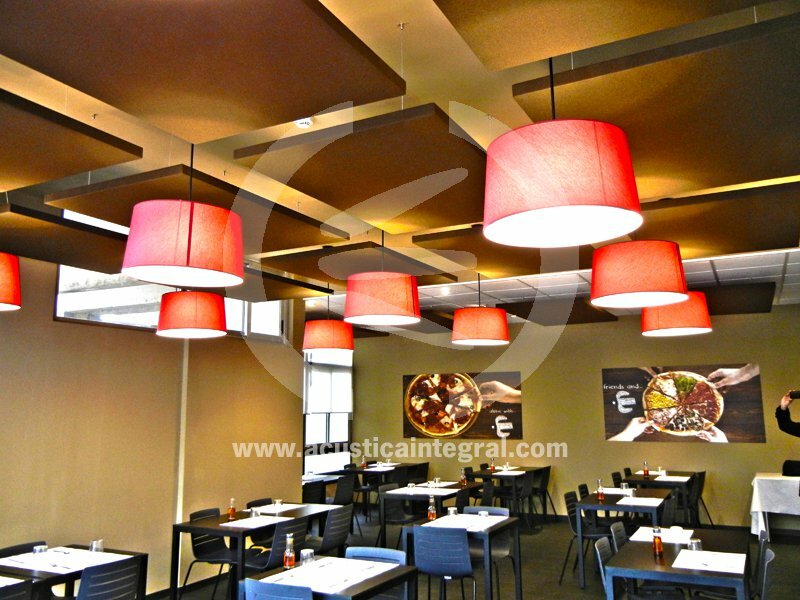 ﻿ Absorbent treatment with acoustic panels for a restaurant. 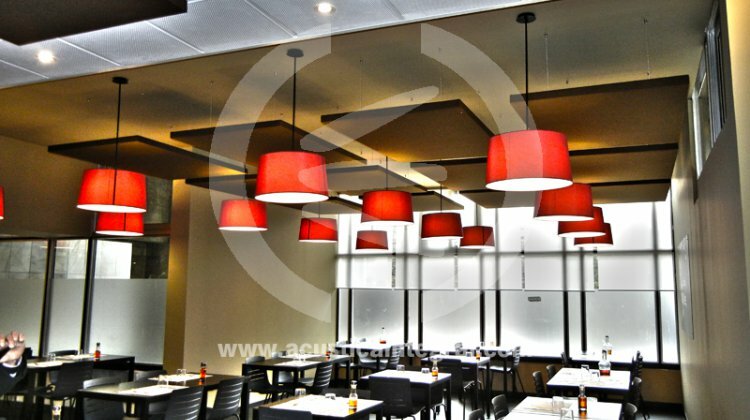 Absorption in a restaurant with Acoustiart. 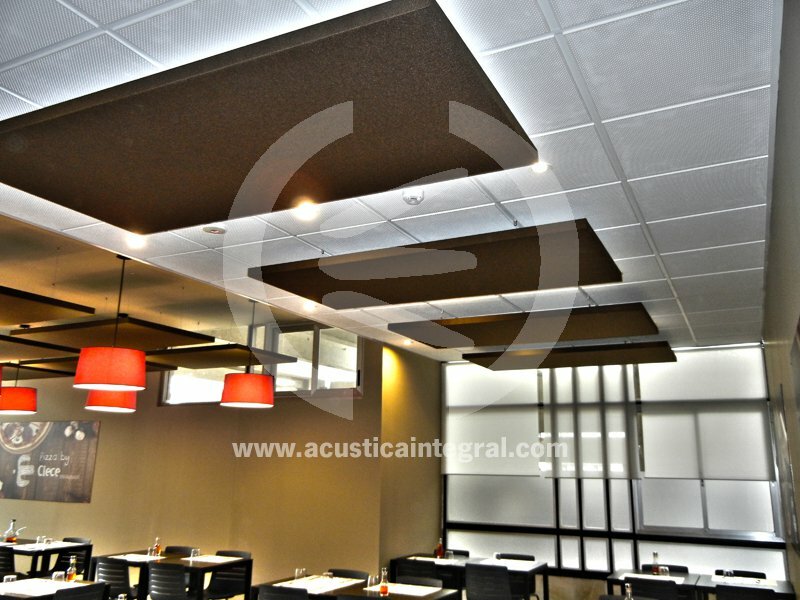 Acústica Integral has performed the absorbent treatment with acoustic panels for a restaurant that had an excess reverberation, by means of Acustiart acoustic panels. 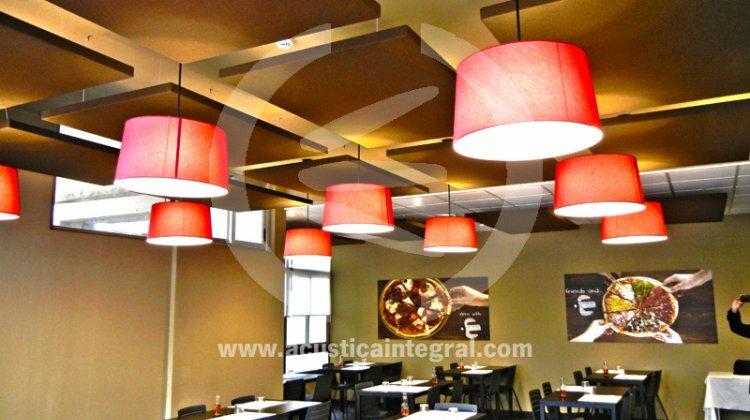 We must take into consideration that the acoustic environment in the catering sector is a parameter that is increasingly more important, as can be the quality of the food and the attention received. 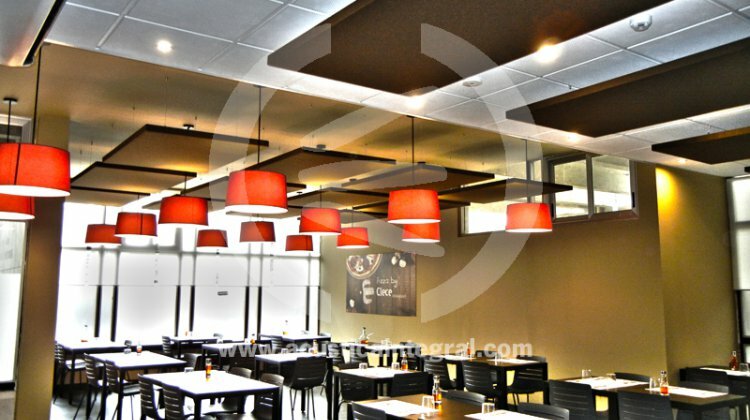 The absorbent treatment of a restaurant with acoustic panels is a suitable method for this type of premises, because it is not very invasive. The acoustic panels can be aesthetically integrated into any environment, without them entailing a disturbance for the decoration, as they can be installed without having to perform any works or refurbishment. 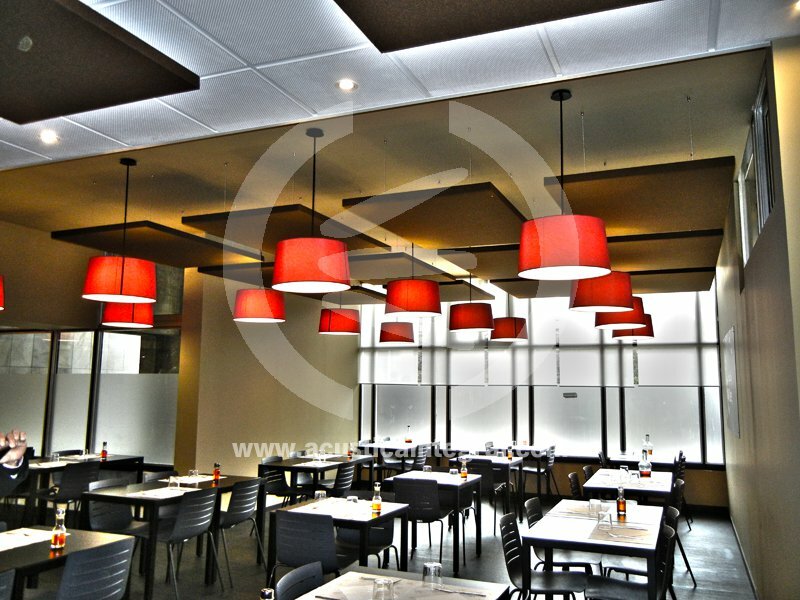 They can be installed on smooth ceilings, accessible ceilings, modular ceilings, etc. thanks to the steel wire hanging system and fixing systems adapted to the base element receiving the fixing. The possibility of being able to separate the acoustic elements from the existing ceiling ensures a wider frequency response and achieves for the absorption to work properly for each type of voice. 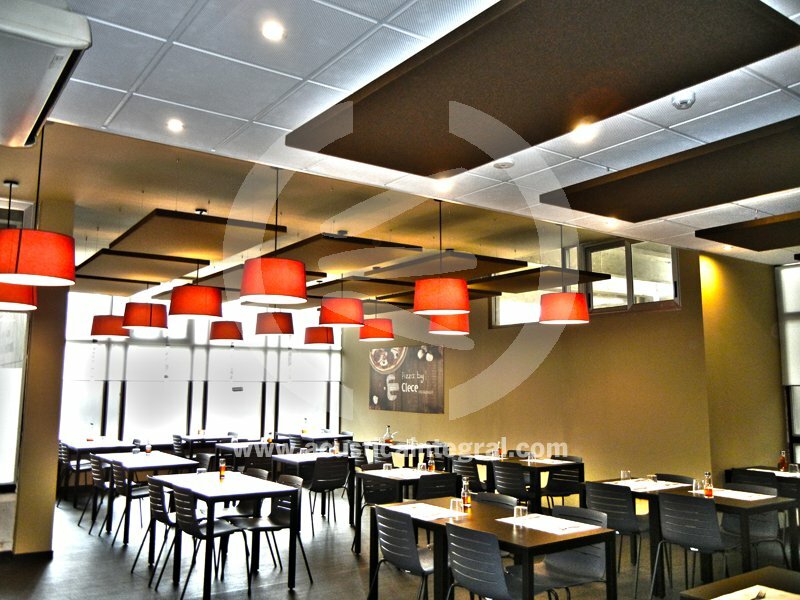 The Cocktail effect generated by the increase of the number of people inside the premises, is compensated with the absorption of the absorbent acoustic panels, enabling a relaxed and comfortable sound environment. The possibilities regarding sizes, colours and shapes enable incorporating acoustic treatments to premises that, due to their aesthetics, do not seem appropriate for this type of acoustic solutions. 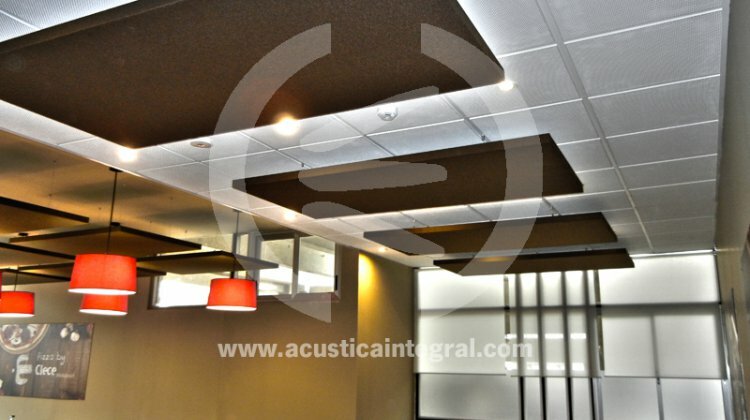 The new materials and extensive research carried out for the development of new products, make possible for Acústica Integral to provide solutions for all possible cases, offering solutions for the client's real needs. The result after the treatment enables maintaining conversations at very low levels, increasing the privacy between the diners, and enabling to enjoy a complete and satisfactory experience, for all the senses.  Acustiart panels for ceiling.  Suspension mounting on ceiling.  Suspension through support kit for ceilings.